I remember the way it felt when the ultrasound tech put the gel on my belly. I was not yet accustomed to the frequency and casual way that I would be expected to undress. Looking back I realize it was good preparation for a kind of naked vulnerability that never goes away once you are a parent. Fear, hope, longing to make things right and have everyone happy, it strips you bare. This year I had to get an inhaler, my stress levels make it hard for me to breathe. It’s funny because all my life I’ve been so strong and healthy, and it’s literally my insistence to do it all that I cannot breathe. You’d think that would knock me into better behavior, but it doesn’t. I carry an inhaler, but the truth is it doesn’t make me breathe any easier. 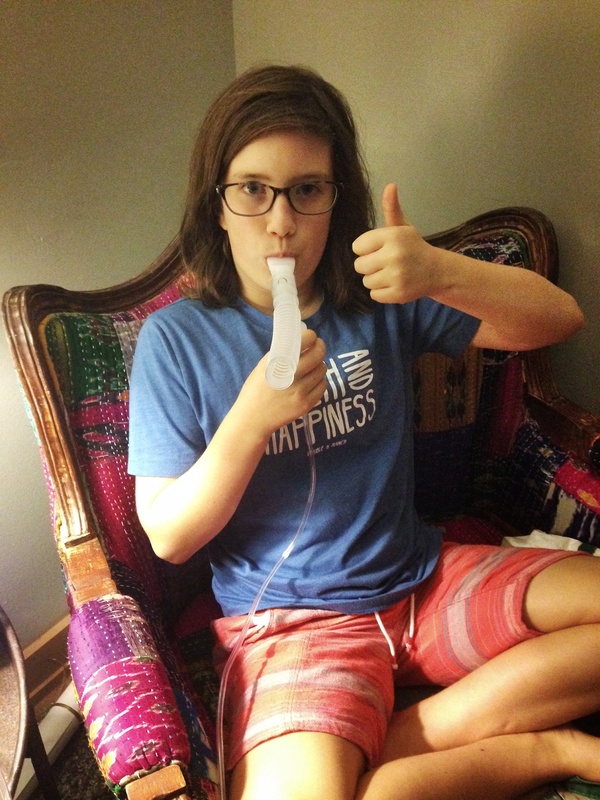 When Avery got sick earlier this year she had to use a nebulizer. It was my first dance with treatment or medication being a part of our daily routine. Even as it helped her breathe, it felt like a failure. Then they prescribed an inhaler—one for school and one for home, “For when I can’t breathe,” she said with a serious face. Last week when I was in Chicago (Yay Cubs!) Sean took Finley to the doctor. The night before I left she’d said, “Mom, sometimes my heart hurts me when it beats. Does that happen to you?” I tried to keep panic at bay, there I was, defenseless from fear; naked. I knew shortness of breath was a moment away, just breathe. Ha! Sean called me in Chicago to tell me that the doctors found nothing wrong with her heart, “Maybe we check her for asthma is what they told me,” he said. I find myself struggling to breathe even as I type this. Air is essential for all of us. 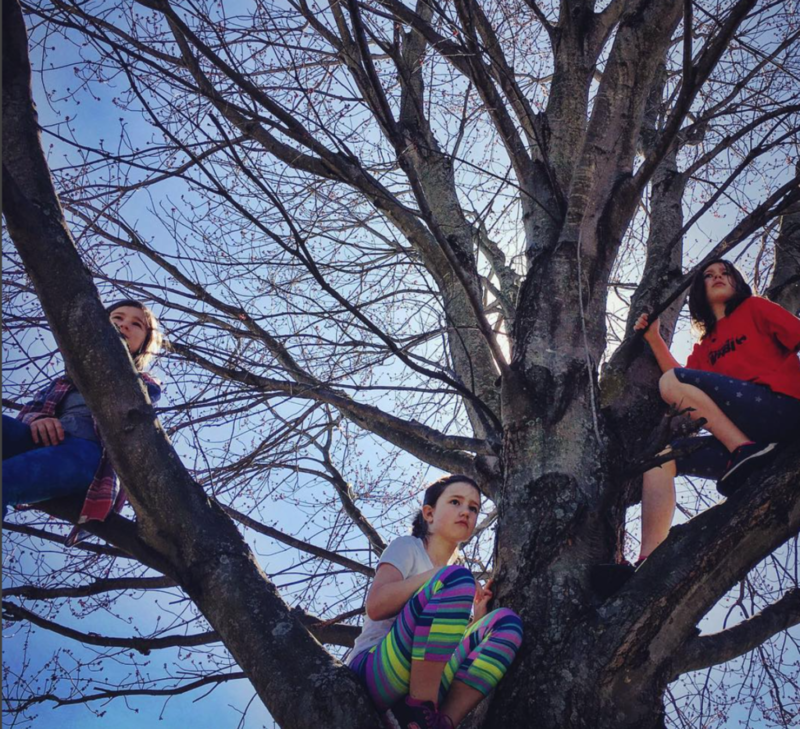 When it comes to my girls, I can’t bear the idea of their breathing being compromised. Our issues aren’t even that complicated. We lead active lives. We have access to and the means to enjoy quality health care. Breathing though, I can’t control it. They are going to need to be able to breathe long after I’m around to help them. I don’t think this is exclusively a parenting issue, seems to me it’s more of a human issue, nor is the sensation of being naked in the face of all the danger and hurt the world throws at us reserved for parents. I was compelled to action by Clean Air Moms Action and my own experiences related to trouble breathing. This election has made my stress spike, my daughters’ breathing difficulty has impacted my breathing, and through it all I have become more aware of my own responsibility. It isn’t just my daughters’ health or the conditions where I live, it’s everywhere and everyone. It’s my responsibility to advocate for a healthy environment and I can do that with my vote. When it comes to voting I am focused on the welfare of people, particularly children. We ignore the issues of Clean Air, Climate Change, and Toxic Chemicals at our peril. Focusing on emails or even sexual misconduct is not the most pressing thing. Itty-bitty lungs, tiny dimpled hands clutched at delicate necks, parents in cities we’ll never know gasping for breath at the idea that their children cannot or should not breathe; this is what we can influence by supporting candidates who care about these issues. Air pollution from fossil fuels leads to bad air quality in too many communities. Increases in smog can trigger asthma attacks and exacerbate other chronic health problems. Don’t let children’s health be voted away to protect polluters’ profits. Instead, vote to protect little lungs from toxic air pollution. The same harmful pollution that is making our children sick is causing rising temperatures and extreme weather events. Our changing climate is making smog worse. It increases respiratory health threats, particularly for people with allergies and asthma. Also intense heat waves exacerbate heart and lung conditions. Dangerous chemicals are found in our daily lives. They often enter our homes and bodies without our realizing it. In fact, these chemicals may not even have been disclosed, identified or studied. Thousands of toxic chemicals found in everyday products are linked to potential reproductive and developmental toxicity, endocrine disruption, birth defects, cancer, asthma, headaches and skin irritants. Children are among the most vulnerable to such chemicals. We can vote to protect little lungs from toxic air pollution. We can vote for candidates who support proposals to cut methane emissions from the oil and gas industry. And vote to put our country on a clean energy path while protecting American jobs. I am using my vote for a candidate who is undeterred by attacks and continues to brave a hostile environment in order to press the most important issues. Donald Trump does not have the safety and health of our children in mind, nor does he have plans to support women. I know for a fact that there are many women out there who have every intention to vote, but are not comfortable talking about in online or in person. If this post does one thing, I hope it’s that it convinces anyone still on the fence that their vote matters. Will you take the pledge to vote? You fill in three boxes. That’s it. Oh, well, I mean then you go and vote next week, but that’s it. It will matter. Clean Air Moms Action is canvassing the country to document real life stories from moms. You can watch more of them on their Facebook page. You can find them on Twitter. Check out their pictures on Instagram.